The mediastinum is an important region of the body located between the lungs. Structures that lie in this region include the heart, the esophagus, the trachea, and large blood vessels including the area. The mediastinum is also home to lymph nodes. There are many conditions that can affect the mediastinum or the mediastinal lymph nodes, including cancer, benign tumors, infections, and more. Understanding the different parts of the mediastinum is very helpful in determining the causes of abnormalities in this region. Let's take a look at the different parts of the mediastinum, and condition that may occur in each area. The mediastinum is the area in the chest between the lungs that contains the heart, part of the windpipe (the trachea), the esophagus, and the great vessels including the ascending aorta (the large artery which carries blood from the left ventricle of the heart on its way to the rest of the body) and right and left pulmonary arteries—essentially all of the organs in the chest except the lungs. It is also home to many lymph nodes and nerves. The word mediastinum is translated as "midway" in Latin, in reference to the middle part of the chest. You can visualize this area by seeing the diaphragm as the bottom, the breastbone (the sternum) as the front, the blood vessels that enter and exit the heart (the thoracic inlet) as the top, and the backbone (the vertebral column) as the back side. On the lateral sides (edges), the mediastinum is bound by the membranes that line the lungs. The mediastinum can be thought of as having two regions, the top and bottom. The bottom (inferior) half is divided into 3 main regions. Even though this may sound like a boring description of anatomy, understanding the structures that lie in each of these areas is very important in diagnosing medical conditions in this region. Anterior: The anterior mediastinum is present only on the left side and contains some small arteries as well as lymph nodes. Middle: The middle mediastinum is the largest portion, and contains the heart, blood vessels including those that travel from the lungs to the heart, and lymph nodes. Posterior: The posterior mediastinum contains the esophagus, many blood vessels and nerves, and mediastinal lymph nodes. Cancer: Cancers such as lymphomas (both Hodgkin's lymphoma and non-Hodgkins lymphomas), some germ cell tumors, and thymomas (cancers of the thymus gland) occur in the mediastinum. Benign tumors: Benign germ cell tumors such as teratomas and dermoid cysts may occur in this region. Malignant lymph nodes: The term malignant lymph nodes refers to those lymph nodes that are cancerous. This can occur due to cancers that primarily affect the lymph system, such as lymphomas, as well as cancers that spread to lymph nodes. In addition to cancers such as lymphoma, that are not uncommonly found in these nodes, cancers such as lung cancer may spread to lymph nodes in the mediastinum. Lymphadenopathy: "Swollen" lymph nodes in the mediastinum may occur with some infections, especially viral infections. Aneurysms: Thoracic aortic aneurysms are a serious condition involving the mediastinum. Nerve damage: Nerves that pass through the mediastinum may be damaged, for example by pressure from a tumor or cancerous lymph nodes in this area. Mediastinal masses are often first noted when a scan is done to evaluate symptoms related to the chest, such as a cough, shortness of breath, or other symptoms. Most masses in the mediastinum are small and do not have any symptoms. When they are large they can cause respiratory insufficiency (difficulty breathing or getting enough oxygen to the tissues) as well as heart problems, such as a drop in blood pressure or decreased blood flow. Anterior mediastinum: Tumors in this regions may include thymomas (tumors of the thymus, an organ in the chest which is fairly large in childhood but essentially disappears in adults), lymphomas, germ cell tumors (such as teratomas), and retrosternal (behind the sternum or breastbone) thyroid masses. Middle mediastinum: Enlarged lymph nodes are a common cause of a mass in the middle mediastinum. These lymph nodes could, in turn, be related to underlying cancer. Bronchogenic cysts may also be seen in this area, as well as cardiac abnormalities such as an enlarged aorta. Posterior mediastinum: Esophageal cancers and other esophageal abnormalities may appear in the posterior mediastinum, and enlarged lymph nodes may also be noted here. Other possibilities include sarcomas, neurogenic tumors, spinal tumors, paraspinal abscesses, and ectopic thyroid tissue (thyroid tissue growing in an area outside of the thyroid gland. A mass in this region could also be extramedullary hematopoiesis. This is a condition in which blood cells are formed in areas outside of the bone marrow, and while often normal in young babies, is usually abnormal in adults. 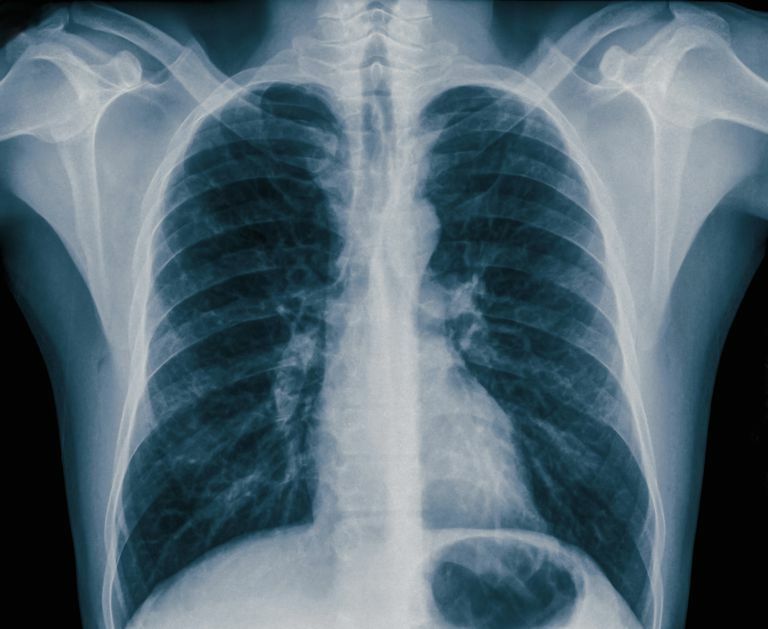 Lung cancer may cause a mass in any part of the mediastinum. It's important to note that there are many more causes of abnormalities in the mediastinum, and most often further testing is needed to define the exact cause. Mediastinitis is a term referring to an infection involving the mediastinum. Mediastinitis is a life-threatening condition that most often develops after cardiac surgery. With cancers such as lung cancer and lymphomas, doctors often evaluate the mediastinum to see if any cancer has spread to this region. One procedure that allows surgeons to visualize this area is called a mediastinoscopy. If a cancer has spread to nodes in the mediastinum it is often treated differently than a cancer which has not spread to this region; the presence of mediastinal lymph nodes is important in the staging of lung cancer. Mediastinoscopy was a common procedure for those diagnosed with lung cancer, but the same information may sometimes be available now via a PET scan. Examples: Joy had a procedure done to see if her lung cancer had spread to lymph nodes in her mediastinum. Barrington, S., and R. Kluge. FDB PET for Therapy Monitoring in Hodgkin and Non-Hodgkin Lymphomas. European Journal of Nuclear Medicine and Molecular Imaging. 2017 Apr 14. (Epub ahead of print). Li, W., van Boven, W., Annema, J., Eberl, S., Klomp, H. and B de Mol. Management of Large Mediastinal Masses: Surgical and Anesthesiological Considerations. Journal of Thoracic Disease. 2016. 8(3):E175-84.